4) All Power Fasterners wedge bolt anchors shall be per manufacturer’s published information. 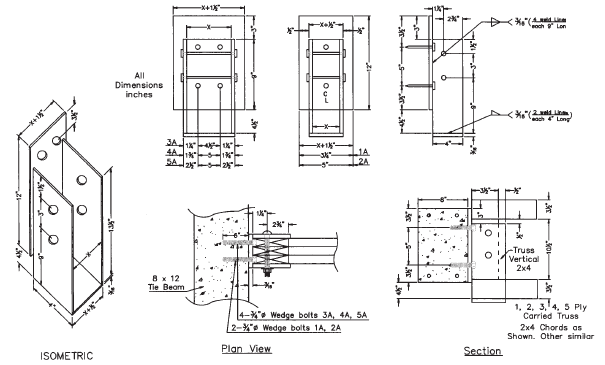 Minimum anchor diameter is 3/4″ and anchor embedment shall be 6″. 6) All bolt values in wood comform to NDS 2005 for southern pine, G=0.55. Values for other species shall be adjusted as per NDS 2005. 7) Bolts shall not penetrate Truss Top and bottom chords and shall only be through Truss Verticals. Bolts thru wood shall conform to section 11.1.2 of NDS 2005. 10) Provide plywood shims to close the gap between carried truss and steel connectors to prevent bending of bolts.